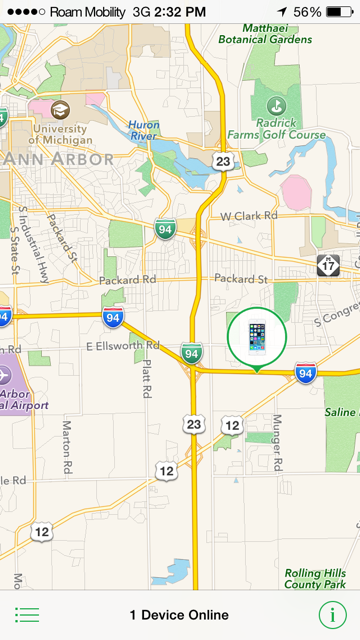 I lent my newly upgraded Roam Mobility SIM card to my sister for a 2-day trip to Michigan. I told her I would foot the bill for her service if she would report back with some speed test screen shots. We both have an iPhone 5S and I was curious to see what kind of speeds her phone would get. 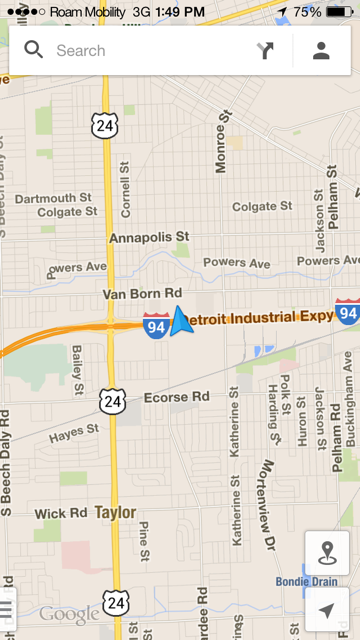 I double checked the locations in Michigan where she would be staying. 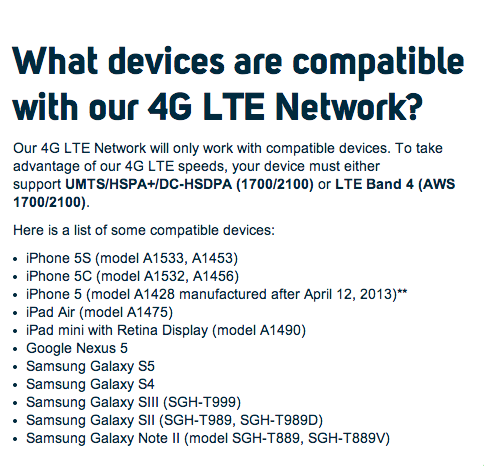 According to both Roam Mobility’s website and T-Mobile’s site (the network Roam Mobility is actually using), they claimed LTE service would be available to her almost all of her trip. 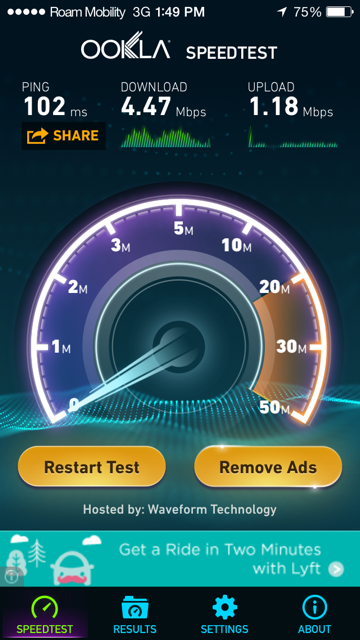 The 3G speeds are actually great…for 3G. 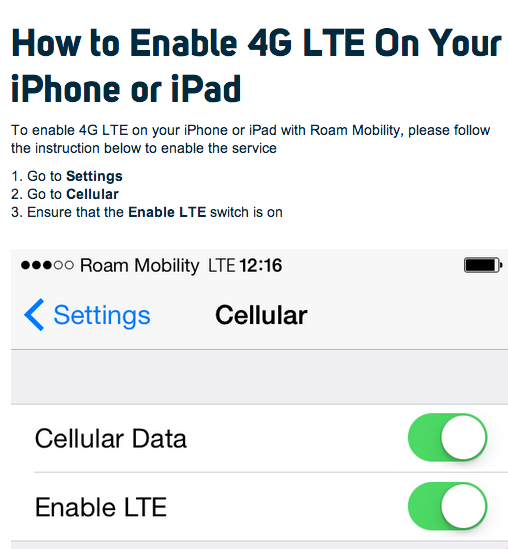 But Roam Mobility now supports LTE. Why is the phone showing 3G? Ok, my sister is pretty good with technology, but she could have messed something up, right? 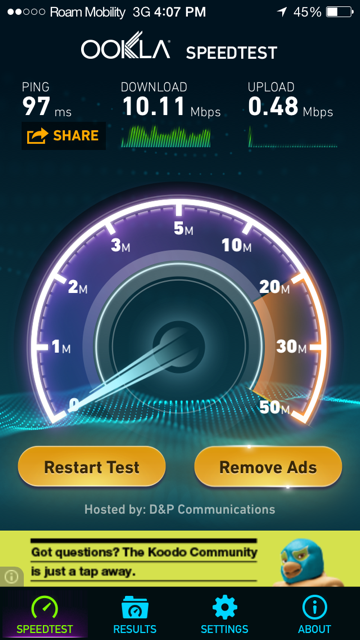 Maybe LTE is turned off? Let’s check that because maybe changing SIM cards somehow turned off LTE. But where is the LTE option? 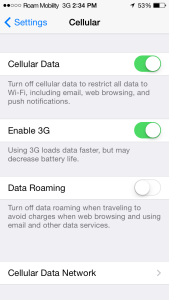 I’m pretty sure that screen should show “enable LTE” not “Enable 3G”. If the feature is not available on your iPhone 5/5c/5s device, we recommend that you contact Apple customer service to troubleshoot and resolve the issue. You can do this by visiting this Apple Support Article or visit your local Apple Store or Apple Authorized retailer. If you have any further questions with other issues, please contact our care team via email or phone so we can ensure you have a great experience with our service. 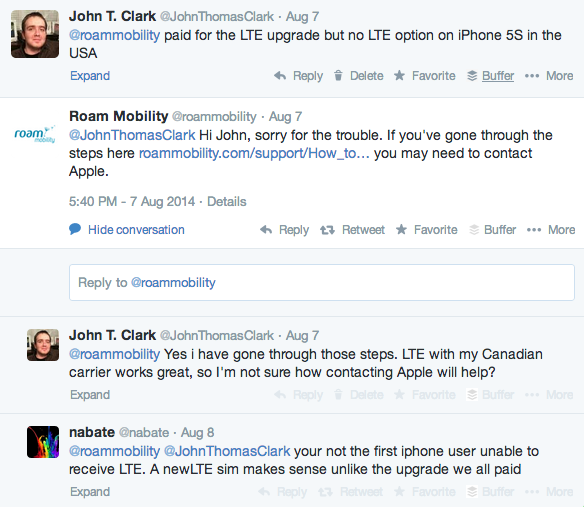 I contacted Roam Mobility support on August 7, 2014, first by email and then, after waiting a few hours, via Twitter. So they are trying to blame this on Apple? Come on! There are a number of people with the same issue on Twitter and Roam Mobility’s Facebook page. I’d be perfectly happy if they would just acknowledge the issue and say they are working on it. I’d be ecstatic if they included a timeline. But blaming Apple? That’s pretty sad. I did finally receive a reply to my email support request, 13 days later. Did I mention my sister’s trip was 2 days? It was an automated message that contained a link to the LTE support sections on their website. For even having the ability to use LTE on Roam Mobility’s network I was forced to pay a $1.99 fee per SIM to “upgrade” my SIM cards to support LTE. I try not to think too hard about why this is even technically necessary because it’s only $2. I don’t actually need LTE speeds, but since I’ve paid for the privilege, I want my iPhone saying it’s connected to their LTE network! Despite their lack of LTE, I still need data when I travel to the US and I still don’t want to pay my Canadian carriers’ horrendous rates, so I’m sticking with the lesser of two evils, Roam Mobility on 3G, at least for now. Just be forthcoming Roam and don’t try to brush off your customers like we’re idiots with your false assurances! Using 3G is not a deal breaker but don’t outright lie and assure me of something that is not true. Same thing is happening to me today. 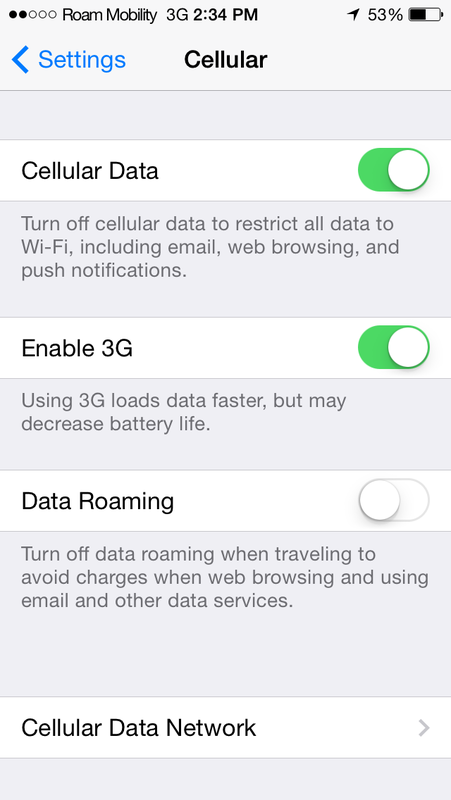 Rogers SIM card shows LTE in settings and Roam Mobility SIM card shows only 3G. I upgraded my sim to LTE when the announcement first came out and I was given a new number at the time. Clearly not getting LTE.